Björn Christiernsson needed seven metre long beams for building the family’s new house, but there was no such thing to buy in the commercial timber yard. 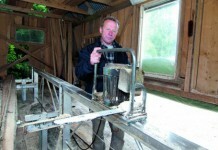 Instead he bought an extended LOGOSOL Sawmill, and cut the timber to the right lenght for the project. 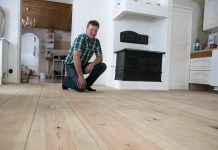 “The longest solid wood beams you can buy are 5.5 metres,” Björn says to explain why he decided to saw the timber himself. Björn is famous in Sweden for being the carpenter on a Swedish TV show, where they renovate and alter homes. 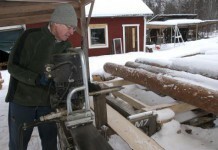 Since earlier, Björn owns a Big Mill Timberjig, with which he has cut quite a lot of timber. 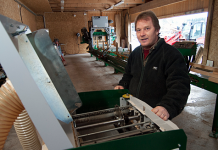 He also shares a LOGOSOL Sawmill with his realtives on an island in the province Sörmland in Sweden. Besides the carpentry assignments on the Swedish TV show, Björn and his partner Karolina Heuren were planning the construction of the house of their dreams, a self-designed house outside Stockholm. The construction would require a great deal of sawing, in all, 150 metres of beam made of spruce, the longest more than seven metres long. transporting the beams through the city of Stockholm was not tempting. 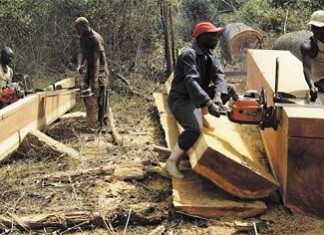 The solution was to buy their own LOGOSOL Sawmill, an extended M8, which will stand at the worksite and be used for sawing all sorts of timber for building the house. This will not be a commonplace house. Basically, it will be two buildings laid in a cross. The ceiling will go all the way up to the ridge, and on the outer walls visible collar beams will run. The largest free length will be seven metres. The walls will be built of lightweight concrete blocks that then are plastered. The façade will also have standing wood beams. It will be what you could call a modern interpretation of a half-timbered house, with large window areas. 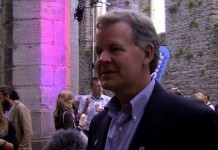 “We have received help from a friend who is an architect. We gave the design the finishing touches on a computer,” says Björn, who has had time to get familiar with the family’s future home virtually. 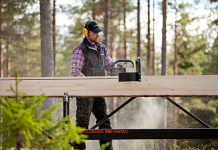 With a sawmill on the building site, you can supplement with wooden details, without going to the timber yard or caring about what is available on the shelves. 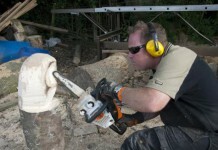 Should Björn come up with the idea that some additional beams or an area of roughedged siding boards would do the trick, he can just start his LOGOSOL sawmill and cut what is needed.